In 2016, we’ve had four animated family films about anthropomorphic animals going on wacky adventures (Norm of the North, Zootopia, Angry Birds, Finding Dory). Most of their plots touch on familiar ground. Granted, some did it better than others, and I wouldn’t blame you if you felt fatigued by now, wishing another studio could bring something fresh to the table. 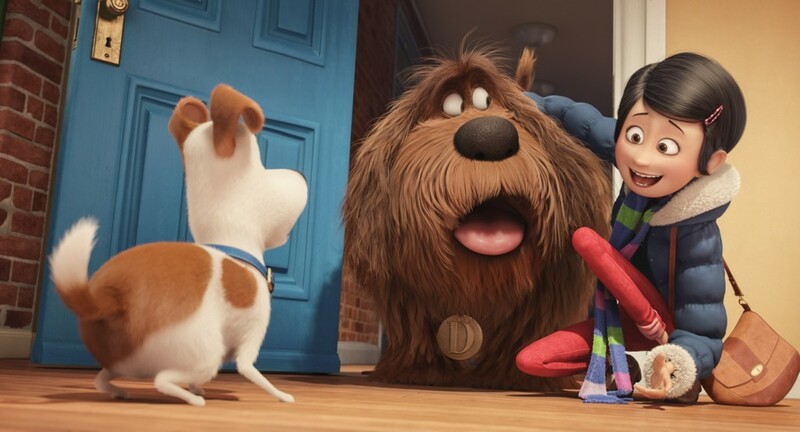 While I can’t say that The Secret Life of Pets reinvents the wheel, radically veers off the trodden path, or reaches some heightened transcendency, it works hard to make you and your family laugh — and with likable, colorful characters, it succeeds. Directed by Chris Renaud and Yarrow Cheney, and from Illumination Entertainment, the production company that made Despicable Me, this film is set in sprawling Manhattan and follows a dog named Max (Louis C.K.) and his adoration for his owner Katie. However, his world is turned upside down when Katie comes home with a new dog, Duke (Eric Stonestreet). 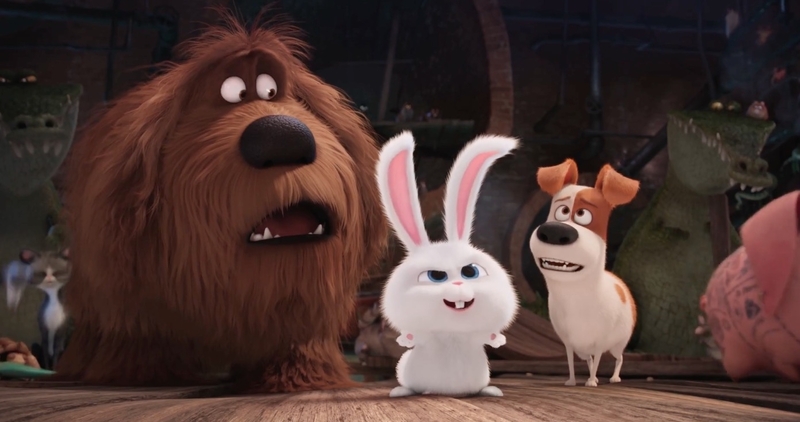 The infighting between Max and Duke drives them away from their home and inevitably to meet Snowball (Kevin Hart), a stray rabbit who leads a dangerous pack of animals intent on getting revenge on their former owners. The most unsettling part about The Secret Life of Pets is how eerily similar it is to Toy Story, from concept to plot to characters. The concept is about pets doing human things while their owners are away like watching television, blasting heavy metal music, or being massaged by a beater. Of course, the moment their owners return, they go right back to being normal. The plot is about a beloved character having his world upset by an interloper and must do everything he can to get rid of him. When this gets them into trouble and far away from home, they must overcome their differences and grow together because of it. Max is a beloved leader and friend in his community of pets that becomes jealous of Duke, a bigger, stronger dog. Sound familiar? While subplots and some of the characters differ, its resemblance to Toy Story is almost undeniable. If there is any damning fault to the movie, that is it, and that’s a shame because the concept has more potential than being a knockoff of another movie. Despite this, the voice acting from Louis C.K. and Kevin Hart are top notch and hilarious. It feels odd hearing a mild, toned down Louis C.K., but as the movie went on his character and acting grows on you. Renaud and Cheney clearly allowed C.K. to breathe and be himself, providing his own voice and comedic style to shine through his character. Kevin Hart as a maniacal little white bunny plays perfectly on that comedic juxtaposition, and you can tell he isn’t holding back. Arguably, Hart’s performance outshines all the rest. 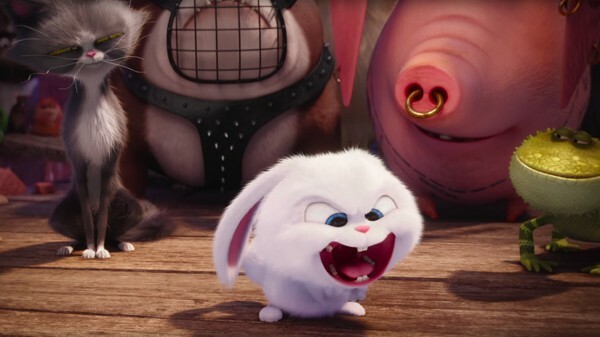 The comedy, otherwise, takes a lot from the wacky and over the top silliness that you expect from Despicable Me or The Minions, but in animal form. The comedic timing is well paced, and it varies from C.K.’s dry humor to Hart’s silly anger. Overall, it has Finding Dory and Zootopia running for its money in the comedy department. Illumination Entertainment steps up their animation game in this film, and they show that in the first five minute opener. I would highly recommend watching it in 3D. The bright, rich colors and compelling artistry easily help bring you into the movie, but also feel relaxed and comfortable, enjoying the eye candy. Pet owners, animal lovers, and cat video addicts will not doubt find plenty to be happy about with the various concepts and characters introduced through-out, if they haven’t found it already in the other movies released this year. In the end, however, great potential surrounds The Secret Life of Pets, but it just doesn’t seem interested in reaching it. The lack of originality and emotional depth knocks it down a few pegs, leaving it as a highly entertaining comedy movie, but not much more.